Ash splint makes a fine hardwood seat. With proper care, it will last a lifetime, and then some. 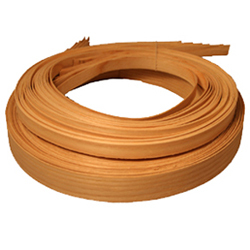 Our machine-cut ash splints come in 1/2″ wide and 1″ wide. 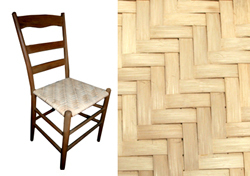 Our Splint Weaving Booklet has detailed instructions for weaving a chair like the one at right in the pattern shown. We include lots of illustrations so you’ll never wonder what we’re talking about. It’s easy and fun. Splint seats have a long tradition in the United States, where they were woven with splints hewn from timber on the early settlers property. If you have an old family chair, you own a treasure. Keep it in good shape and it’ll last for generations. If you’re not sure what size or product you need, our Choosing Your Supplies page has recommendations for every kind of chair seat frame.